NASA has updated a statement released about a new measurement of the expansion rate of the universe, a term called the Hubble Constant to clarify the precision survey of the cosmos. The new measurement, made by NASA's Spitzer Space Telescope, was originally announced to be the most precise measurement to date of the speed of the universe's expansion. Now NASA officials say this calculation is "one of the most precise measurements" yet, and that it agrees with an independent measurement made last year using Hubble Space Telescope data by scientists at the Space Telescope Science Institute in Baltimore, Md., led by astrophysicist Adam Reiss. "When Adam brought his study to our attention, we worked with both parties to correct and update the story," Whitney Clavin, a spokeswoman at NASA's Jet Propulsion Laboratory in Pasadena, Calif., which manages the Spitzer mission, told SPACE.com. The original announcement was made Oct. 3, and was updated Oct. 5. The Spitzer measurement of the Hubble Constant was made by observed pulsing stars called cepheids at various distances from Earth. These stars' distances can be calculated by timing their pulsations, which are related to their inherent brightness. The Hubble study looked at a special class of supernovas, which are also useful distance indicators, to make its calculation of the universe's expansion rate. Both measurements have about the same estimated error margin of 3 percent. The Spitzer team calculated that the universe is expanding at about 74.3 kilometers (46.2 miles) per second per megaparsec (a megaparsec is roughly 3 million light-years). The Hubble team's measurement last year came up with 73.8 kilometers (45.9 miles) per second per megaparsec. The two values agree with each other within their error bars. 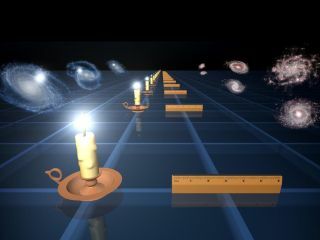 Estimating the value of the Hubble Constant is important for scientists' quest to understand dark energy, or the force behind the acceleration of the universe's expansion. The 1990s discovery that this expansion rate was speeding up shocked scientists at the time, and won Adam Reiss and two other astrophysicists, Saul Perlmutter and Brian Schmidt, the 2011 Nobel Prize in physics.